TSI Donates 100 books to the Marine Toys For Tots Literacy Program. - Transformation Systems, Inc.
TSI Donates 100 books to the Marine Toys For Tots Literacy Program. TSI employees and their guests gathered at the Gaylord National Resort in National Harbor, MD on November 5 for TSI’s Annual Banquet and Awards Celebration. 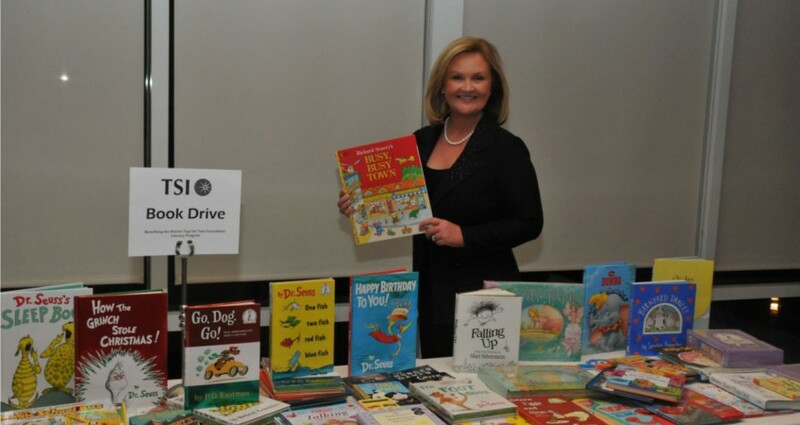 TSI celebrated the company’s 2011 success and used the gathering to promote a good cause with a book drive benefiting the Marine Toys for Tots Foundation Literacy Program. TSI employees enthusiastically donated over 100 new books. The Marine Toys for Tots Foundation Literacy Program is one of TSI’s charities of choice as part of their Feed to Lead Program. The Literacy Program puts books in the hands of economically disadvantaged children giving them the opportunity to improve their reading skills and experience the joy of reading. TSI CEO Marta Wilson started the Feed to Lead Program which commits multi-year funding earmarks and time to fight hunger and promote literacy and STEM education. For more information about the program.